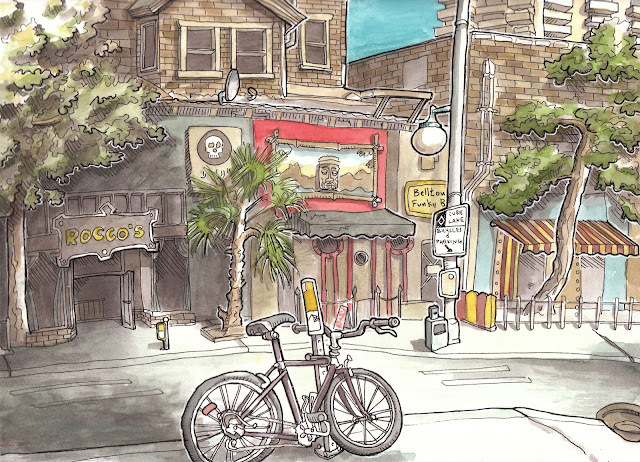 Urban Sketchers Seattle: Belltown with Tommy and Gabi. Belltown with Tommy and Gabi. Sitting in front of Bedlam Coffee with Tommy Kane and Gabi Campanario. Magical day for this big fan of both of these artists. Because of Tommy's work in An Illustrated Life and on the web I started drawing more regularly, and because of Gabi's Urban Sketchers I got to meet the artists in Singapore and Bangkok. Wonderful sketch. Wish I was there, or wish to see you guys in Cleveland some day. Really nice. Love the bricks and little pops of color. I don't remember those places across from Bedlam. Am going to have to go there one of these days soon. Excellent sketch! And the three of you together must have made a rockin' sketchin' trio!